Laon is the capital city of the Aisne department in the Picardy region of northern France. We had visited Laon a few years back on a cold gray day and caught a couple of pictures of the cathedral. This visit was to explore the city in more detail. Topographically, Picardy is a fairly flat plain with few exceptions. Laon is built on one of these exceptions - a 330 foot flat topped prominence providing a natural command over the surrounding area. 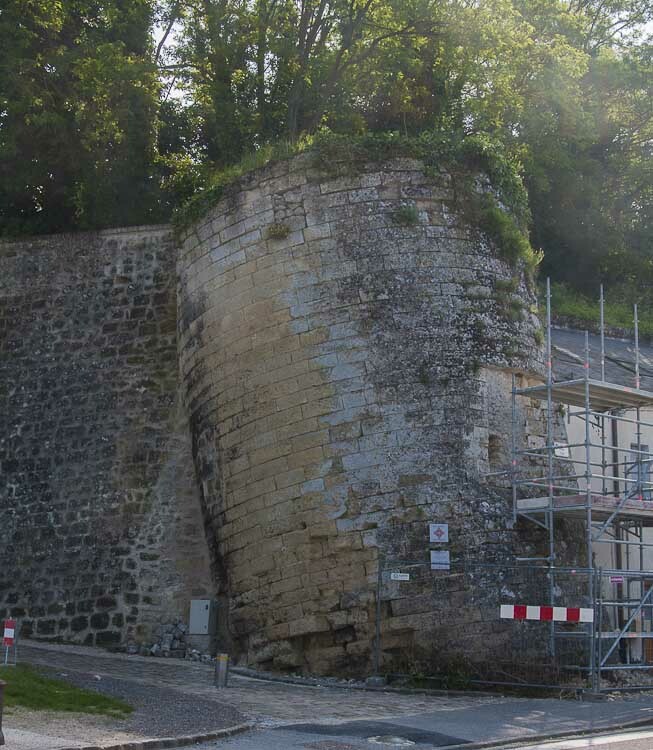 The strategic importance of this was not lost on the Romans and Julius Ceaser fortified the existing Gallic village that existed when he arrived and successfully warded off invasions by the Franks, Burgundians, Vandals, Alans and Huns over the following years. Remegius, the archbishop of Reims, was born in Laon and instituted the bishopric of Laon at the end of the fifth century, elevating it to one of the principal towns of the kingdom of the Franks. During the Hundred Years' War Laon was attacked and taken by the Burgundians, who subsequently lost it to the English only to be retaken by the French after the consecration of Charles VII. Following the Revolution in 1789, Laon permanently lost its rank as a bishopric as religion throughout the country was snuffed out. 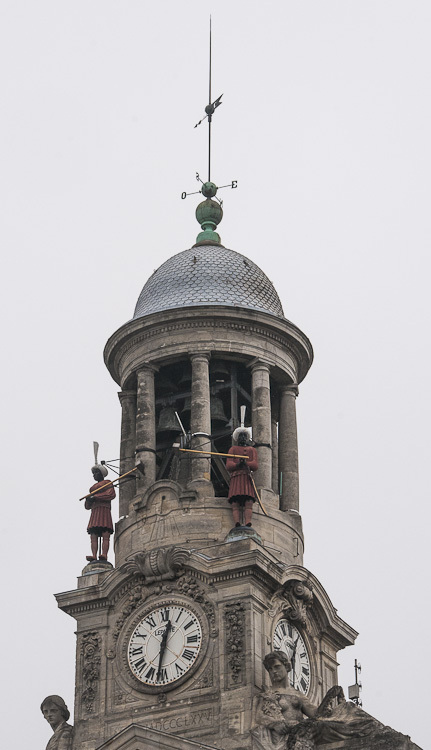 The city was next caught up in the Napoleonic Wars when, in 1814, Napoleon unsuccessfully laid siege to it. In 1870, during the Franco-Prussian War, the cathedral and the old episcopal palace were damaged before the city surrendered to the Germans in September 9. In 1914, during World War I, German forces captured the town again and held it until the Allied offensive in the summer of 1918. The city still contains a number of medieval buildings, some of which are detailed in the pictures here. 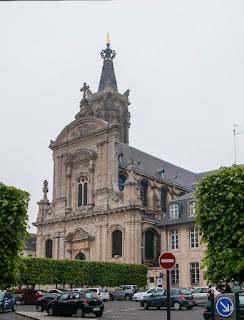 In the late middle ages and early rennaisance, Cambrai was a significant religious center and one of the significant and powerful cities of northern France. It is situated on the Escaut river in the Nord department of the Nord Pas de Calais region and was at one time a walled city with a typical complement of access gates or portes. In 1543, Charles V, the Holy Roman Emperor of the time, conquered the city and added it to his already significant possessions. 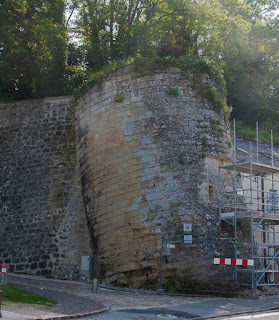 After having Saint Sépulchre, the medieval monastery, demolished he built a citadel in its place. A century and a quarter later in 1677, with Louis XIV in control of the fortunes of France, he determined to "safeguard the tranquility of his borders for ever" part of which included the re-capture of Cambrai and restoring it to France. 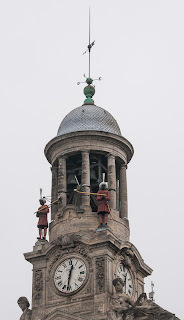 Louis supervised the siege personally and the city fell to him in April of that year. One hundred and twelve years later, in 1789, came the end of the French Royals with the Revolution. The Revolution was not kind to Cambrai. The Comité de Salut Public sent Joseph Le Bon to the city in 1794 to begin the era of "terror" and he sent many citizens to the guillotine. Le Bon himself was tried in 1795 and promptly executed. Most of the religious buildings of the city were demolished following the revolution and the old cathedral, apparently an exquisite building, was sold to a merchant who operated it as a stone quarry. By 1809 everything was gone except the main tower which collapsed in a storm during that year. More recently, Cambrai became the Duke of Wellington's headquarters for the British Army of Occupation, from 1815 to 1818 following the Napoleonic drama. From November 20 to December 7, 1917, the WWI Battle of Cambrai took place in the area. This battle is sometimes noted erroneously for the first mass use of tanks in a combined arms operation however there had been several earlier deployments April, May, June, July and October of that year. Mark IV tanks were used at Cambrai but were still found wanting and became mostly ineffective after the first day. Today, with a decling population of 32,000, Cambrai is like many erstwhile northern French cities: unkempt, dirty, poorly laid out for use in the 21st century and burdened with a hodge-podge of architectural styles. Another example of the avid conservation relegating the city to a museum piece. Click here for picture show. 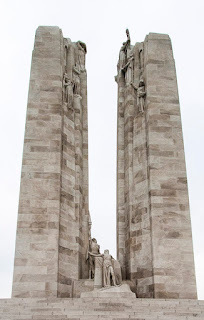 On a cold and extremely windy Tuesday, having stocked Penny Pilote for the road and completed our other chores, we visited the Canadian WWI Vimy Ridge Memorial, a few miles from Arras. 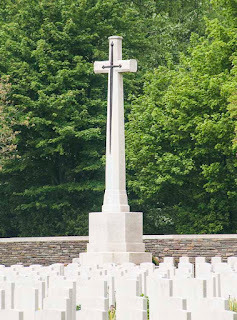 The Battle of Vimy Ridge in fact, was part of the First World War Battle of Arras in the Nord-Pas-de-Calais region of France. In essence it pitched four divisions of Canadian Corps against three divisions of the German Sixth Army and the engagement raged from April 9 to April 12 1917. Supported by a creeping barrage, the Canadian Corps captured most of the ridge during the first day of the attack, the town of Thélus on the second day before the final objective, a fortified knoll located outside the town of Givenchy-en-Gohelle, fell to them on April 12. By nightfall the Canadian Corps was in firm control of the ridge which had fallen under German control in October 1914 during the "Race to the Sea" across northeastern France. There were approximately 97,000 Canadians in the Corps which suffered 10,602 casualties during the battle: 3,598 deaths and 7,004 wounded. The German Sixth Army suffered an unknown number of casualties with approximately 4,000 men becoming prisoners of war. At the time, the Vimy Ridge force was the largest assembly of Canadian Corps to be engaged in a single action and is regarded by some as one of the defining events in the forging of the Canadian armed services. In the weeks leading up to the battle, the British discovered that German tunneling companies had built an extensive network of tunnels and deep mines from which they would attack French positions, setting off explosive charges beneath their trenches. The Royal Engineers quickly deployed their own specialist tunneling companies to combat the German mining operations. The grounds of the memorial site are still honeycombed with wartime tunnels, trenches, craters and unexploded munitions, and are largely closed off for public safety. The Canadian National Vimy Memorial itself is Canada's largest and principal overseas war memorial. Located on the highest point of the Vimy Ridge, the memorial is dedicated to the commemoration of the battle and to Canadian Expeditionary Force members killed during the First World War. France granted Canada perpetual use of a section of land at Vimy Ridge in 1922 for the purpose of a battlefield park and memorial and the 250-acre portion of the former battlefield is preserved as part of the memorial park that surrounds the monument. The memorial took eleven years to build and was finally unveiled on 26 July 1936 by King Edward VIII of England, in the presence of President Albert Lebrun of France and 50,000 plus Canadian and French veterans and their families. By this time of course, inept and crooked politicians on three continents were within three years of steering the world toward the disaster that was WWII. Sure makes one wish that politicians had to take their turn in being shot at. Pictures here.